Research in Chemical Physics and Dynamics concerns several aspects of basic research in chemical and biochemical systems with special emphasis of time-dependent processes. The unifying aspect of the various sub-areas is the need to understand the structure, dynamics and interactions between molecular systems whose size and complexity range from small and isolated molecules in gas phase to gigantic biomolecules in living cells. Furthermore, such studies on molecular and cellular systems could be classified into two categories, namely (i) studies on basic phenomena such as intramolecular charge transfer, vibrational Energy Redistribution, van der Waals or Hydrogen bonding interactions between isolated molecules, mechanisms of spin polarization, mechanisms of hydrogen transfer, etc. and (ii) Studies on biological systems such as proteins, DNA, membranes and intact cells to elucidate mechanisms of protein folding, understanding of DNA-protein interactions, Enzymatic catalysis, mechanism of protein aggregation and their relevance to human diseases. 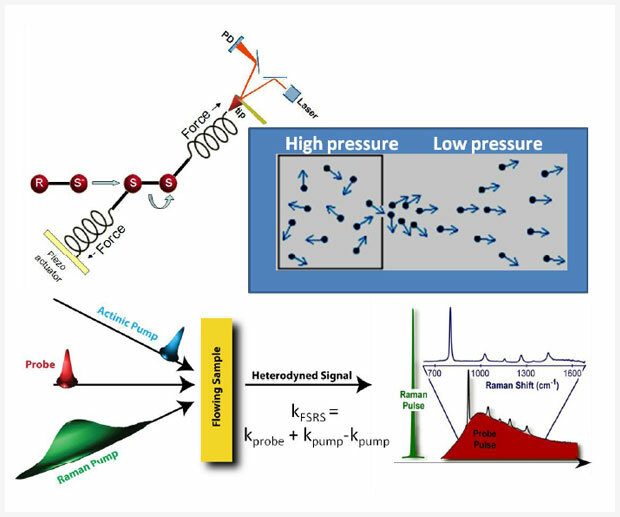 Realization of these goals requires the use of state-of-art spectroscopic and microscopic techniques using ultrafast lasers, magnetic resonance and several optical techniques in conjugation with theoretical approaches to model chemical reactions.